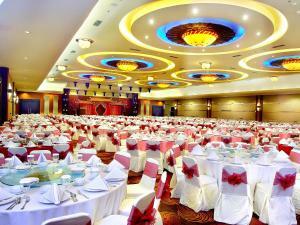 Boasting an outdoor pool and spa, Aston Pontianak Hotel and Convention Center offers 4-star rooms with 32-inch flat-screen TVs in the city centre. Free Wi-Fi is available in public areas. Spacious rooms at Aston Pontianak feature modern furnishings in neutral colours. They are fitted with cable TV, Wi-Fi and a safe. A fridge and tea/coffee making amenities are provided for guests convenience. Guests can shop at the arcade attached to the hotel or relax in the sauna. A well-equipped fitness centre awaits guests looking to exercise. Private karaoke cabins are available on the dedicated entertainment floor. 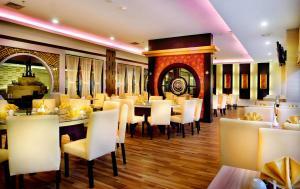 Dynasty Restaurant offers a range of exquisite Chinese dishes. Light refreshments are available at Aston Pontianak’s Coffee Shop and Bar Lounge. 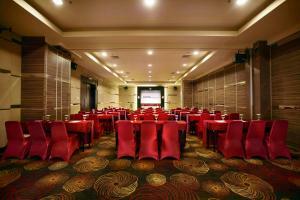 Hotel Pontianak Aston is a 20-minute drive from Supadio Airport.